Seeking a gas lift stool with a twist? 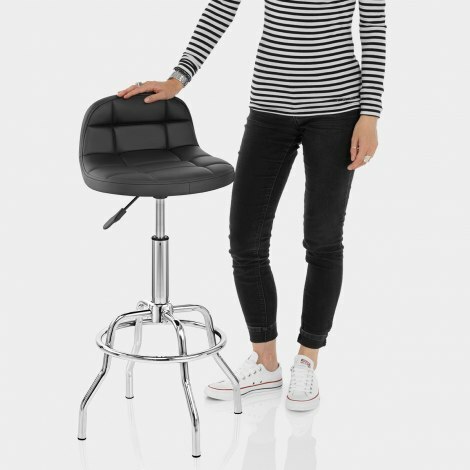 Then look no further than the Summit Bar Stool Black. 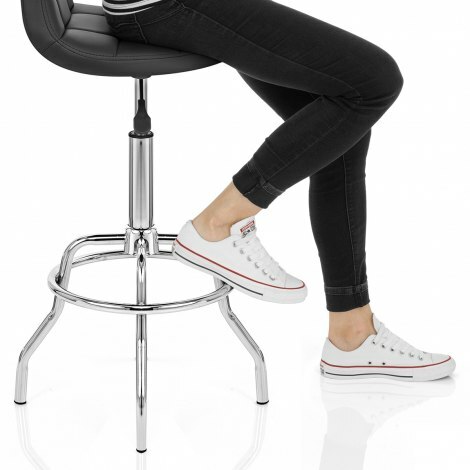 Offering the sturdiness of a four-legged design with the adjustability of a gas lift, the Summit Bar Stool is a fantastic item that will bring modern class to the kitchen. Representing the peak of modern design, it brings a generously padded black faux leather seat together with a highly unique set of metalwork. While the former sports a minimal backrest for a spot of support, the latter offers various features. The gas lift mechanism makes it easy to adjust the seat's position as you see fit, and works alongside 360 degree swivel, giving you control over the Summit. Four legs emerge from below the gas lift while a circular footrest surrounds the structure, re-enforcing it alongside providing a perch for your feet. Finally, a set of protective plugs accompany the underside, reducing friction with your floors. "Happy with purchase, lightweight yet sturdy and very comfortable"
Great value adjustable stool and looks great too. Extremely happy with purchase, lightweight yet sturdy and very comfortable. I ordered two of these stools as two old stools with circular weighted base are fallen apart. Delighted with the swift delivery and with the quality of the stools which are reasonably priced. My family particularly like how light they are to move about. The four legs are a bonus. Fits in perfectly well with my black and white kitchen glad I chose this one.